A new augmented reality framework from Disney Research could allow fans to take selfie photos with Augmented Reality Mickey Mouse, Darth Vader or Iron Man mimicking the user's poses. 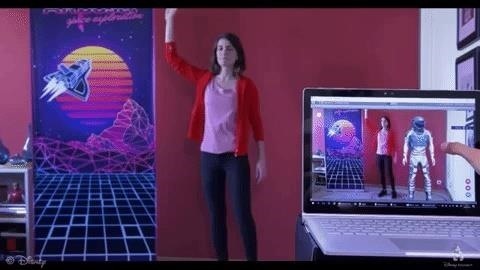 Called AR Poser, the prototype experience in image recognition, to anchor the virtual content and the computer vision to identify a person in the scene and to appreciate the pose. After identifying the person, the application created with the Vuforia AR platform will display a digital avatar with the next pose match among a series of predefined poses. The 28-page research publication, co-authored by Robert Sumner, Associate Director of Disney Research, and his colleagues Gokçen Çimen, Christoph Maurhofer and Martin Guay, are available for download from the Disney Research website. "The focus of our solution is on a set of predefined poses (selfie poses) designed to reduce ambiguity," the team wrote. "In a nutshell, our method consists of two reliable steps: First, we perform a 2D pose estimation and then a projection onto the 3D subspace to find the closest matching 3D pose. Selfies are automatically created for a variety of different poses. " The solution is not unlike recent research from Facebook's full-body AR camera effects, which were released earlier this year and will soon be available for the Facebook app. AR Poser was integrated into film posters for film promotion allow moviegoers to create personalized selfies with digital characters (as opposed to the posse cuts found in movie theaters, as I've done in the past.) Disney has already had experience with AR posters through Facebook's image recognition capabilities. In line with the CEO's AR preferences, Disney Research innovations range from AR game applications to film production techniques to amusement parks, and in the coming months we can probably expect the team to continue to create new AR experiences with Disney's entertainment interests are consistent.